On the last morning at Tswalu we decided to take one last look at the Wild dog den just to see if there was any action. On arrival and scouting around the area all we found were a few WD's hunkering in the bushes trying to keep warm and out of the cool winds. Keeping on the outskirts of the boundary line to the den we parked up in the hope that perhaps one nose may just venture out... Time went by and it was getting closer to when we had to make tracks back to the strip and the suddenly, like an erupting volcano, thirteen WD pups exploded our of the entrance and mayhem set in, with pups running in all directions, knowing where to frame, let alone focus became a role of the dice. Then within minutes they all disappeared back into the safety of the den. 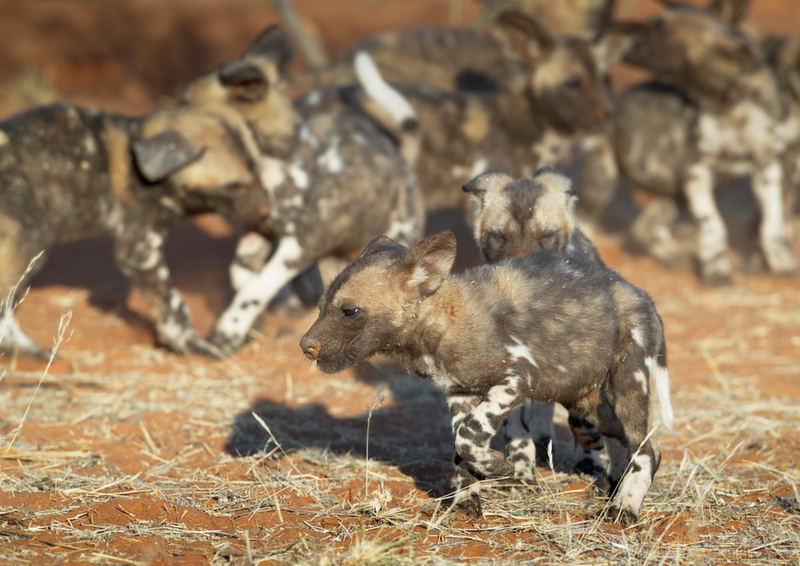 I learnt that day that the pack had then decided to move location which wasn't unexpected as we had been there when the adults were coxing the pups to stray further from their den. Love the scene and action. Very appropriate title. Sure tells the story-I like treading about them too-thanks.